As Multidões Fervilhantes: Polyommatus amandus... where is it? Polyommatus amandus... where is it? Pair of Amanda Blues in copula, picture taken in Greece, 2011. 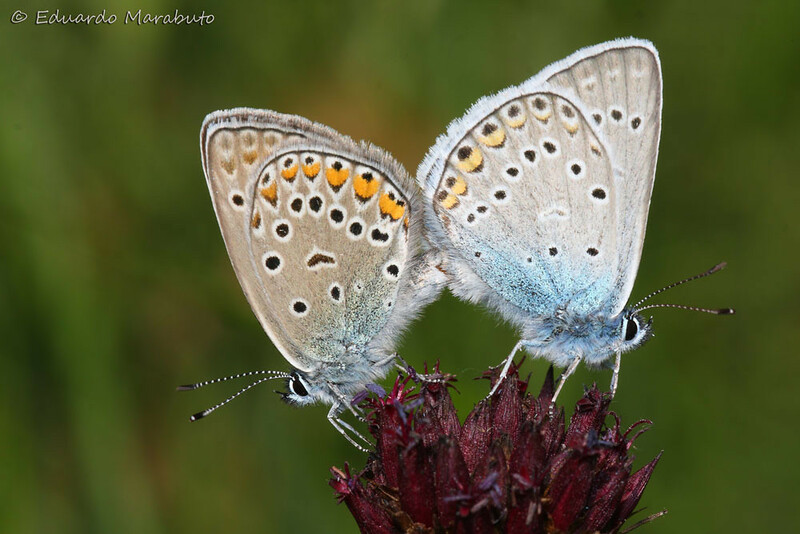 Among the many brightly coloured little blue butterflies found in mountain meadows the Amanda blue, Polyommatus (Agrodiaetus) amandus is one of the largest. It is indeed a handsome species dwarfing most others and clearly standing out with a deep blue upperside and faint markings on the underside. It is found in much of Europe but not being a truly mountain species and favouring rather mesic meadows with Vicia spp. (the foodplants) one would suppose it would be found in Portugal too, albeit only in the north would it be able to thrive. So far, there are no reliable records for the country but year after year as more work is undertaken in the neighbour spanish province of Galicia, new records approaching the portuguese territory may indicate the species is around, albeit probably very local and overlooked! So this 2012 I call everyone interested in observing butterflies in Portugal to go to the field and try finding this beauty.